Here we read about laughing at destruction and famine, which is what God would do in a similar situation. Whatever you do, please do NOT take this message out of context, because it's not what you may think it is saying. Even though, some circumstances people have are not funny, but when you read Psalms 2:4, we see God laughing at His wicked enemies. And, He is allowed to do that. It seems if God, can laugh at His enemies we can laugh at our’s from time to time. 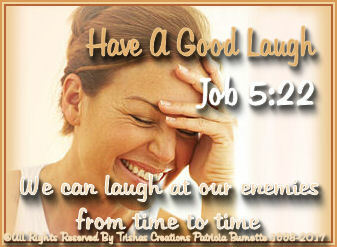 When things come against those we don’t need to be uptight or sensitive, all we need to do is stay Godly while we laugh! We wouldn’t be laughing at the problems, we would be laughing at the fact that it cannot do any permanent harm, because God is on our side! A laugh is always good for us, and if we don’t we cannot stay in a joyful happy mood. So, Have a Good laugh –– it can be for anything! !